CHAMPAIGN, Ill. (August 7, 2018) – Dr. Bruce Fraedrich of Charlotte, North Carolina, is the recipient of the 2018 International Society of Arboriculture's (ISA) Award of Merit. ISA's most prestigious Award of Distinction, the Award of Merit, acknowledges Fraedrich's service in advancing the principles, ideas, and practices of arboriculture. Click here for a video on Dr. Bruce Fraedrich. Fraedrich holds a Ph.D. in plant pathology and is on staff at the Bartlett Tree Research Laboratories where he currently serves as vice president of research. During his career, he has also been a lead volunteer instrumental in the development and revision of ANSI-A300 standards for the arboriculture industry and the accompanying Best Management Practices by ISA. 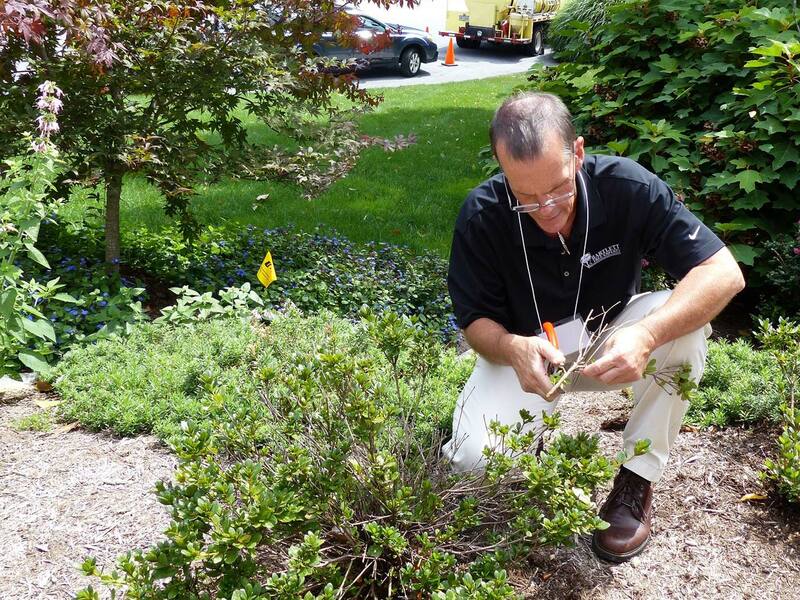 Bruce Fraedrich discusses damage to azaleas during a plant healthcare training session. "Dr. Fraedrich's collaboration on the ANSI standards has led to many advancements in arboriculture practices," says Paul Ries, ISA board president. "Throughout his career, he has demonstrated a committment to promoting professionalism within the industry." Through his work with Bartlett Tree Experts, Fraedrich has led advancements in pruning, tree injection techniques, lightning protection, support systems, and soil management; however, his primary focus has been on disease research and tree risk management. When asked which category he enjoys most, Fraedrich responded, "I would have to say tree risk management is my favorite topic. Risk assessment has evolved and has the biggest benefit to the widest audience because of how we look at trees, rate them, and communicate that to consumers." Fraedrich has spent 42 years in the industry and during that time has seen and contributed to many advancements in arboriculture research. He believes it has been a challenging time for the industry, but in a good way with technology having a major impact. "There's been a lot of change," says Fraedrich. "Especially in regards to the level of professionalism, safety and training. These improvements keep you interested and motivated in the work you do." Collaboration with other professionals is key to continual advancements according to Fraedrich. In regards to the publication of the standards, "It's really about the committee work, and talking with others at meetings and conferences," he says. "Bringing about change involves getting together to talk about the possibilities and improvements." Fraedrich was recognized during the opening ceremony of the ISA Annual International Conference and Trade Show on Sunday, August 5 in Columbus, Ohio. "By recognizing individuals who have a positive impact on arboriculture, ISA helps provide role models and learning opportunities for all of us," added Robert Bartlett Jr., chairman and CEO of Bartlett Tree Experts. "We are proud to see our own Dr. Bruce Fraedrich recognized this year and applaud not only him, but all of the honorees for their contributions in research, education and mentoring." ISA serves more than 30,000 members and credential holders worldwide, and has been honoring members and industry professionals with the Awards of Distinction since 1963. The winners are selected by the ISA Awards Committee, a diverse group of experts in arboriculture, and are approved by ISA's Board of Directors. The International Society of Arboriculture (ISA), headquartered in Champaign, Ill., U.S., is a nonprofit organization supporting tree care research and education around the world. To promote the importance of arboriculture, ISA manages the consumer education web site, www.treesaregood.org, which fulfills the association's mission to help educate the public about the importance and value of proper tree care. Also, as part of ISA's dedication to the care and preservation of shade and ornamental trees, it offers the only internationally-recognized certification program in the industry. For more information on ISA and Certified Arborists, visit www.isa-arbor.com. The F.A. Bartlett Tree Expert Company was founded in 1907 by Francis A. Bartlett and is the world's leading scientific tree and shrub care company. The organization's current chairman, Robert A. Bartlett Jr., represents the third generation of Bartlett family management. Bartlett has locations in 27 U.S. states, Canada, Ireland and Great Britain. Services include pruning, pest and disease management, fertilization and soil care, cabling and bracing, tree lightning protection systems and tree/stump removal. Its corporate offices are located in Stamford, Connecticut.